The salmon are running in the river! And we've got the bait! Order a large pizza for dinner tonight. In a hurry? We sell pizza by the slice. 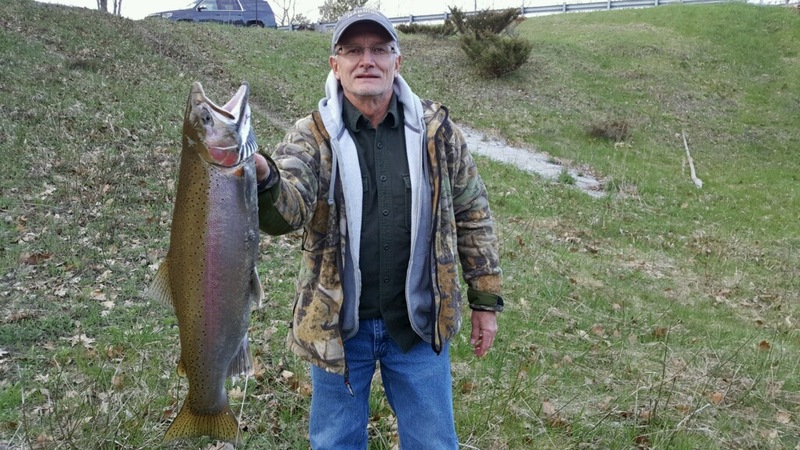 Another steelhead caught by the bridge! 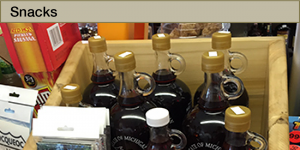 The Trading Post is open Sunday to Wednesday from 8am until 8pm / Thursday to Saturday 8am ’til 9pm. 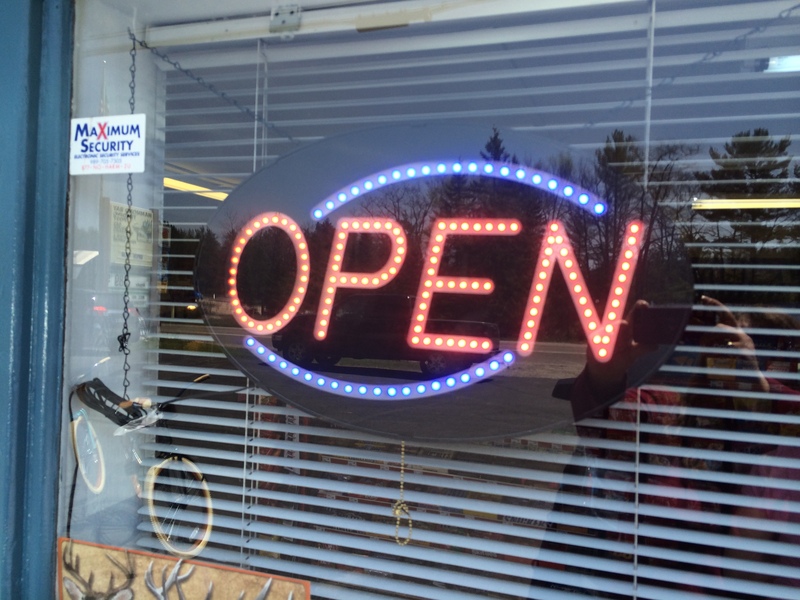 Stop by to meet owners Tom, Tina, Matthew, and Kaitlyn, and see all the store has to offer. The gas pumps are working, we’ve got an ATM machine, and we’re well stocked and waiting for your business. 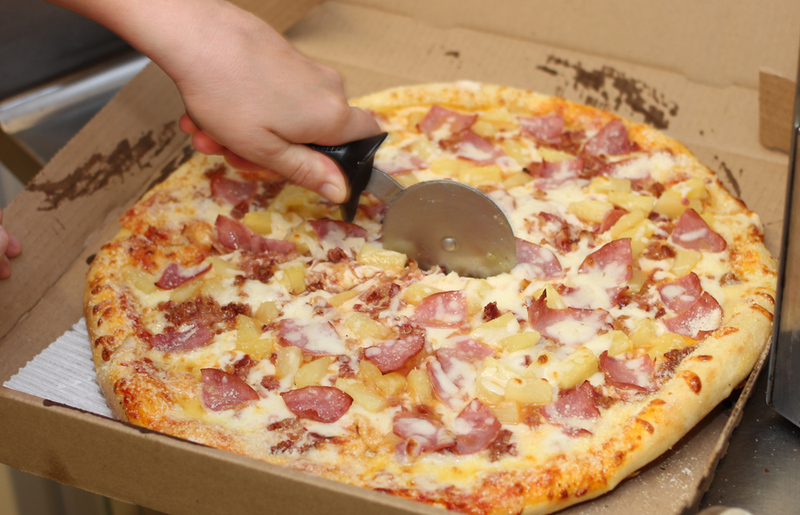 You can even call ahead to order a delicious 3-topping pizza to go. When you need groceries, gas, beer & wine, fishing & hunting supplies, lottery tickets, household items, or anything else, stop on in. 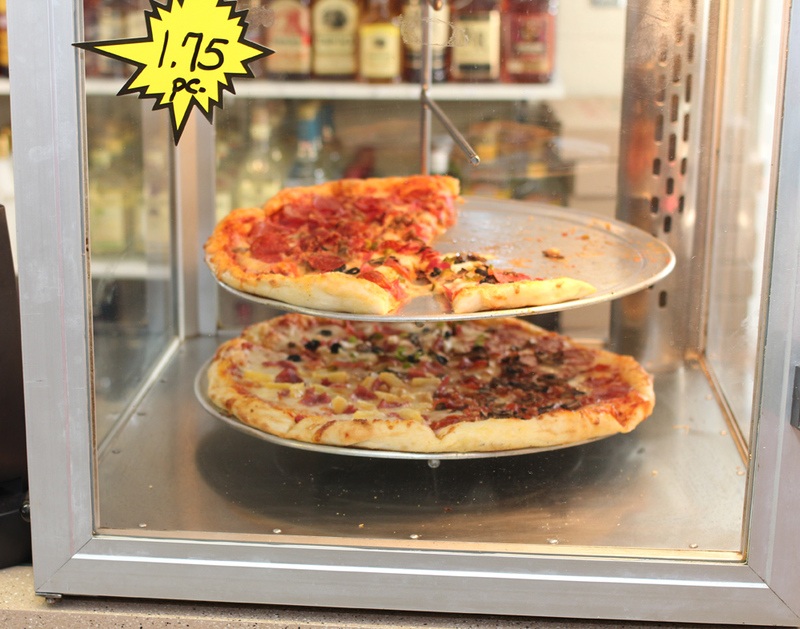 As an added bonus, we now offer pizza by the slice and other hot snacks. When you’re in the mood for a quick lunch, or you just want a break, come by for pizza, or sample some of our delicious food choices. We also feature subs to go and pulled pork and chips on Fridays. Need a cup of fresh hot coffee to wake you up in the morning? C’mon by – or order the cappucino if you prefer. Be sure to try Grandma’s chili, our rotisserie hotdogs, cheesy nachos, and even some delicious hand-scooped Ashby’s ice cream. And, yes, kids, we have Superman ice cream, too! Take your snack out back to the beautiful deck. You must see the fabulous view where the Ocqueoc River meets Lake Huron. If you feel like fishing, there’s a dock for that, too. Tom and Tina reopened the Hammond Bay Trading Post in early May, 2014. It’s freshly painted, freshly stocked, and they’d love for you to stop by and say hello. Take a look at all the food and services that we have to offer. 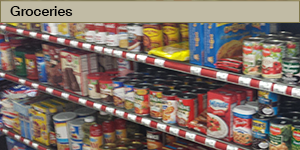 We Carry a Wide Variety of Groceries When you need that last-minute item, chances are we have it. We have charcoal and lighter fluid for barbeques – and propane exchange for gas grills. We also sell milk, bread, cheese, eggs, and other staples. Read more. Need snacks? Well, we’ve got everything from nachos & cheese and hot dogs to Grandma’s Chili and hand-scooped ice cream cones. Not to mention freshly-brewed coffee and cappuccino. 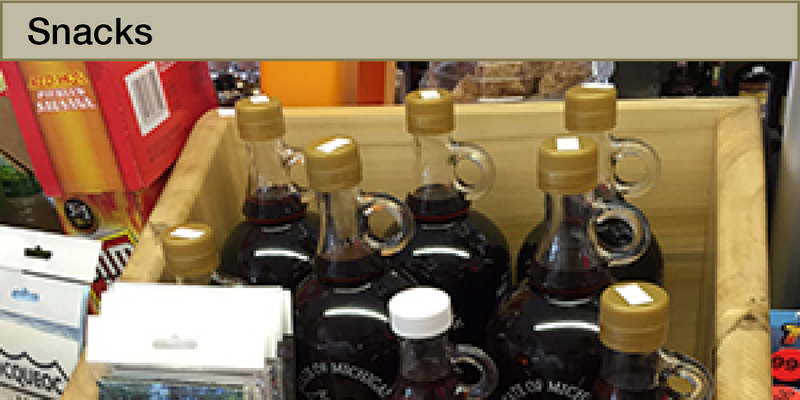 And now, we feature maple syrup made right here in Ocqueoc. Read more. 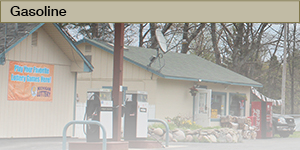 There’s nothing like having a local gas station We pump quality gasoline at market prices, and we offer REC-90, an ethanol-free, 90-octane unleaded gasoline blend designed for use in recreational and marine engines. Read more. Got the urge to see a movie at home? 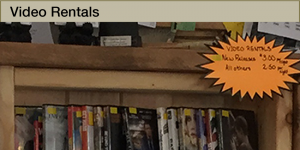 We now rent video DVDs. Keep them overnight and the rental fee for most is $3, although there are some that rent for just $2. And while you’re picking up your video, don’t forget the pizza, snacks and soft drinks. 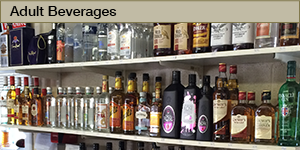 We offer a wide variety of adult beverages including top-shelf liquors, domestic and craft beers, and popular white and red wines. Drink mixers are also available. We also sell cigarettes, cigars, and electronic cigarettes. And don’t forget your bag of ice! Read more. 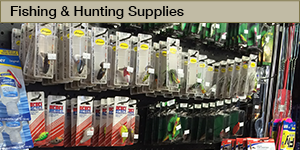 Fishing & Hunting Supplies We stock fish tackle, lures and bait and feature Buc’s Canadian Crawlers. 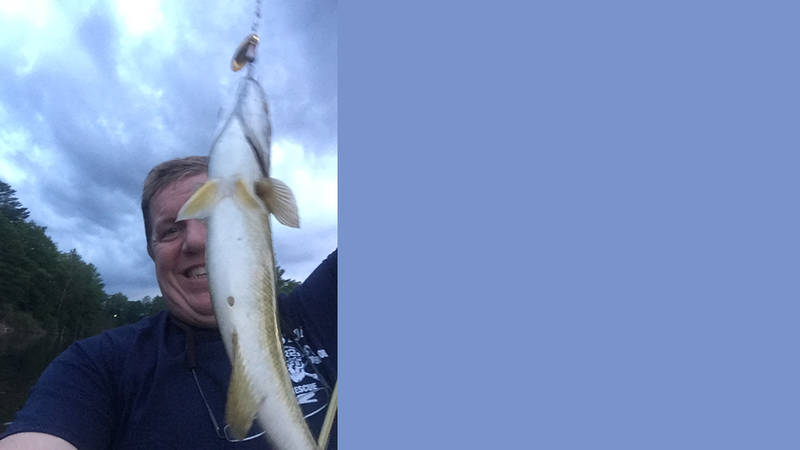 You can get your DNR fishing license here. We also sell ammunition. Dry bundled firewood is available. Read more.